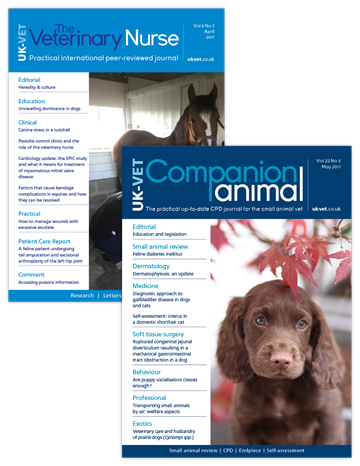 Aimed at veterinary surgeons who care for small animals and exotics, Companion Animal delivers the practical information vets need to inform their practice, while The Veterinary Nurse is dedicated to the educational needs of practising nurses. Combined, they make an all-inclusive resource for staff in a small animal practice. Providing peer-reviewed clinical articles, case studies, research and CPD support for both vets and nurses, they share the latest best practice procedures and encourage continued education. Both journals also provide online CPD programmes, keeping subscribers ahead of their CPD obligations.